“Eber had two sons. One was named Peleg, for during his days the earth was divided; his brother was named Joktan” (Gen. 10:25). So here’s my two cents about how we might see Jesus in Genesis 10:25. Eber means, “across or beyond” and may be related to the word Hebrew (“One from beyond, from the other side”). Peleg means “division” since the earth was divided in his time. Joktan means “strike, beat.” God the Father is definitely “Eber”—from beyond. Jesus, His Son, was “Peleg” and “Joktan” at the cross. That is, He was struck and beaten; His body was broken and divided (Luke 22:19). The breaking and dividing of Christ affected the entire creation. 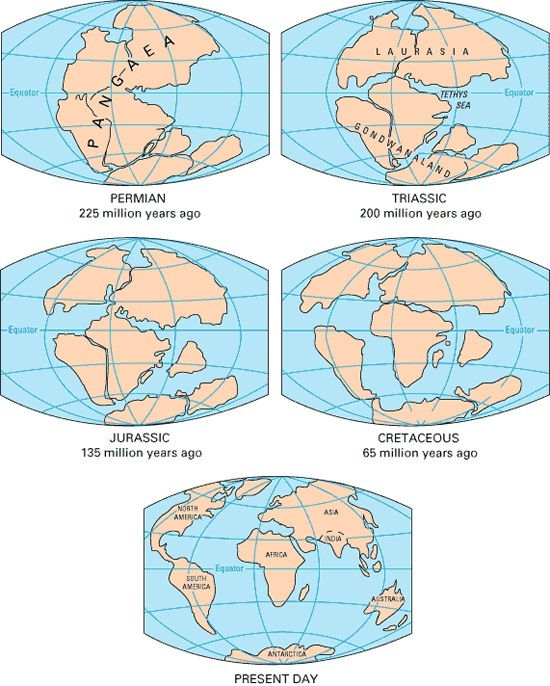 The days of Peleg saw the end of Pangaea and the emergence of a world transformed. So too, the days of Christ’s death, burial, and resurrection saw this world crucified and a new creation born in Christ’s resurrection (Gal. 6:14; 2 Cor. 5:17). Amen. Thanks for your thoughts, Miklos! For the natural man, the separation of the continents is problematic especially when culture, travel and communication is concerned. For the spiritual man (in Christ), there is no problem with the separation of the continents because we are all united in the Holy Ghost.